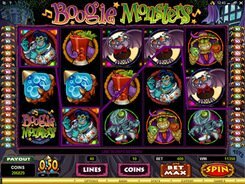 In the Boogie Monsters slot machine you will see amusing and not at all scary creatures that have got in the game from horror films and cartoons. 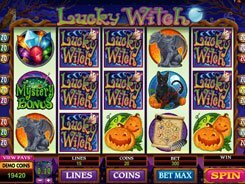 Have no fear of the ghosts and spirits as they are aimed to bring luck in this five-reel forty-line video slot. You can put at stake a maximum of 10 coins per line. A coin denomination is adjusted in a flexible manner to suit your budget, from $0.01 to $0.5. The top bet per spin is $200. 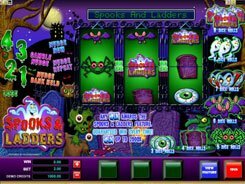 There’re 32 potential winning combinations formed from cocktails, wolves, monsters, lamps and other ghost-themed symbols. 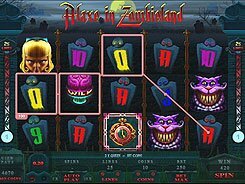 The slot has no wild symbols, yet it features two bonus rounds. 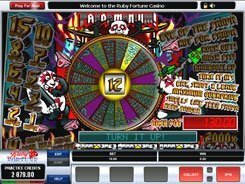 In one bonus round you can get 13 free spins with all wins multiplied five-fold. 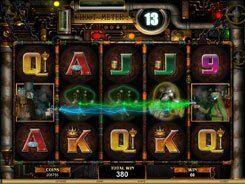 The free spins are triggered by 3 or more Lamp symbols scattered on consecutive reels. Three or more bats appeared anywhere on the reels start another bonus round. In the Fat Bat bonus game you are to pick hidden bats that reveal random cash prizes, with a maximum possible award of 24,000 coins. 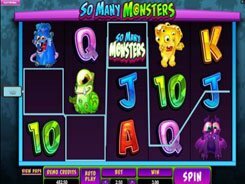 Your bonus winnings will be added to your main game wins automatically after the bonus feature is complete. PLAY FOR REAL MONEY!